Food dehydrators are key to making dried fruit or any other type of dried food. 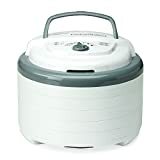 We have shared the best food dehydrator 2019 below compiled from our favorite appliances on the market. The Excalibur 9-Tray Electric Food Dehydrator is viewed as the “holy grail” of food dehydrators. With an adjustable thermostat, ample drying space, convenient timer, and non-stick tray inserts, there’s too much to love about the 3926TB. Based on its price tag at about $241, you’re getting the best dehydrator in today’s market. Upon first look, you’ll notice that the Excalibur 3926TB doesn’t look like your average dehydrator. Strangely enough, it looks similar to a file organizer instead of a kitchen appliance. And this isn’t a bad thing. With 9 trays, this dehydrator was designed to keep all of your food organized. Unlike competing products, the Excalibur 3926TB has a square shape. This makes it easier for the food to be heated in a uniform fashion. Its compact size prevents it from taking up too much space on your counter. With two color options (black and white), the Excalibur will easily match with your kitchen decor. Besides its design, the Excalibur 3926TB has a unique airflow technology. For instance, it uses a Hyper Fluctuation Technology. This helps keep your food’s enzymes and nutrients intact. It keeps the temperature perfectly balanced, high enough to prevent mold, spoilage, and yeast and low enough to keep the enzymes active. If you’ve ever used a food dehydrator before, you’re probably familiar with “case hardening.” This occurs when the moisture remains trapped inside the food, but the dehydrator dries out the food’s surface. As a result, bacteria and mold grows out of the dehydrator, making your food inedible. Fortunately, Excalibur 3926TB’s technology prevents this issue from happening. Consumers love the Excalibur 3926TB because of the additional features that come with it: an adjustable thermostat and a timer. You can adjust the dehydrator’s temperature to heat the food you’re dehydrating properly. In fact, Excalibur includes a temperature guide placed in front of the machine so you know how high or low you need to set the thermostat. It has a temperature range of 95°-155°F. This means that you can dehydrate food such as herbs at low temperatures and more robust foods like jerky at higher temperatures. Also, it has a 26-hour timer! Users like this feature because they can set a specified time and return to some high-quality food. The only disadvantage is that it doesn’t have solid mats. If you’re trying to make dehydrated yogurt or fruit leather, you’ll have to purchase them separately. However, this small flaw is just a minor inconvenience, and you can buy the mats at an inexpensive price. Still, we believe that the Excalibur 3926TB is one of the best dehydrators on the market. Not only does it have multiple compartments, but it also helps beginners use the right temperature to keep their food dehydrated. We suggest that you buy the Excalibur 3296 TB in order to meet all of your food dehydrating needs! For those who need a food dehydrator that avoids mixing plastic with their food, the Magic Mill Professional Food Dehydrator Machine is the way to go. It contains BPA free food racks that are constructed out of stainless steel for easy cleanup. If you’re looking for this device, it’s on Amazon at a price about $130. The Magic Mill Pro Food Dehydrator has a fan and heater placed in the rear of its dehydration compartment. This prevents food particles from falling in the electrical unit. Unlike other dehydrators who have their food located at the base, this keeps your food safe and saves your kitchen from a fire hazard. With its 7” fan diameter, the food is evenly heated and ensures that you’ll receive a good result each time you use this device. 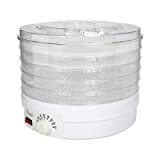 Most of the customer reviews of the Magic Mill Pro Food Dehydrator has been positive. For instance, one owner reported that they were able to cut off their drying time by 3 hours in comparison to their previous dehydrator. In addition, with the digital timer, they didn’t have to worry about overdrying their food. Another owner stated that they were able to cut down the time it took to dry their jerky for about 6 hours, compared to waiting 2 days with their old dehydrator. Consumers also liked the machine’s quiet running fan and how the door can be replaced without having to restart the timer. Also, its easy to use controls with its blue backlight display (although some users preferred having the controls in the front of the dehydrator and not in the back). With the Magic Mill Pro Food Dehydrator, you can make half gallon yogurt jars with ease. Unfortunately, some systems have different compartments missing. One complained that the dehydrator came without the door handle attached, another didn’t have an instruction manual. Make sure that you check the contents of your dehydrator when using it for the first time. The digital thermostat has over 8 preset temperature settings. The temperature ranges from 95°F-158°F. And, it has a digital timer that you can set up in 30-minute intervals. With a total time of 19.5 hours, you don’t have to worry about your food. Plus, its automatic shutoff function makes it great during emergencies. If the temperature is too high, the machine will turn off to prevent overheating the machine. This safety procedure has made it easier to operate the machine without it causing a fire in one’s home. The Ivation Electric Food Dehydrator is a compact, yet powerful tool that most enthusiasts will love. It has similar elements and design features as some high-end models that are 3x its price. You’ll be able to grab one on Amazon at a price around $105. Ivation is a new brand that’s unheard of by some consumers. But this countertop unit acts and performs just as good as the high-end models that are priced 5 times higher than it. On average, you can have a full set of dehydrated food within 2 hours. This unit is easy to use and has a convenient control panel placed on top of the unit. It also has a digital display that allows you to see the current temperature. You can quickly set the temperature via the “+” and “-” buttons. And it has a timer that helps users adjust the time with their food. This prevents the food from becoming over-dried and inedible to eat. Just set the time and temperature and wait until the machine notifies you to remove the trays. When it comes to versatility, the Ivation Electric Food Dehydrator is a one of a kind. It has six drying racks that you can digitally adjust the temperature for the best drying results. Every rack is about “13” x “12” on average, giving you enough room to store your foods. Don’t worry about the food residue that occurs on most low-quality dehydrators. It collects anything that falls off of during the dehydration process. This dehydration machine is easy to clean and can protect your food from spilling. The thermostat has a temperature range of 95°-158°F. With its auto shut-off feature ensures that keep your food heated safely. And, it has a solid sheet and a mesh sheet included with the device. You can use the solid sheet for fruit leather while using the mesh sheet to delicate herbs and food. Whether you want to dry fruit, herbs, or jerky the Ivation 480w Electric Food Dehydrator Pro has you covered. You can use its low temperature for herbs while using its high-temperature settings for your chicken, jerky, beef, and other meats. Overall, the Ivation is a good mid-level dehydrator which heats your food in a uniform and safe manner. With its multiple drying racks, you don’t have to worry about your food being under or overcooked. This dehydrator with multiple drying trays and 15 square feet of space has a faster drying process than other appliances. It also helps that it makes dried food quickly, but it also comes with a 1 year warranty. The Nesco FD-75A Snackmaster Pro Food Dehydrator is a simple, yet effective device. It allows users to cook their food in hours and not days like other products. And it has over 12 trays which give you a large range of food to heat in one setting. If you are interested in this product, get it on Amazon at a price about $79. When it comes to design, the Nesco FD-75A is a great addition to your kitchen. It fits in almost any kitchen due to its compact size. It looks contemporary and doesn’t take up too much space. It has a neutral color, so you don’t have to worry about it not matching with your kitchen colors. It blends easily with your kitchen, making it a great appliance for any household. The Nesco FD-75A has a dishwasher friendly rack. Maintaining the device is simple; all you have to do is clean the trays after using them, and that’s it. Remember to unplug the device before adjusting the racks fully. One thing that makes the Nesco FD-75A unique is its recipe instruction manual. You’ll get a bunch of helpful and useful recipes with well-detailed sheets. The sheets contain valuable information such as the time needed to dehydrate the food and the required thickness of the fruit your dehydrating. Thus, you’ll be able to make a lot of interesting recipes using this device. You’ll like this food dehydrator because of its enhanced heating power. It has over 600 watts of power to provide top quality service when heating your food. While it doesn’t have to use the entire 600 Watts, it spreads the heat according to the power requirements of the food thanks to the precise and sensitive thermostat. This allows it to save power and make precise measurements. If you want a cheap food dehydrator, the Nesco FD-75A is the greatest option. 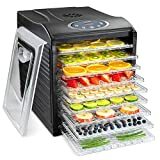 Not only does it have more trays than other dehydrators in its price range, but its unique drying mechanism keeps your food dehydrated faster. Give this dehydrator a look if you want an inexpensive and efficient appliance in your household. When it comes to food dehydration, you need a high-quality machine to ensure that your food is thoroughly cooked. But that doesn’t mean you should pay for the most economic option. Doing so will result in machines that dry your food unevenly and longer completion times. One example of this is the Rosewill Countertop Portable Electric Food Fruit Dehydrator Machine. It has only 5 trays, but each of them tends to hold only a small amount of food; making it difficult to prepare large meals. 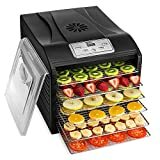 If you need a quick dehydrator for a weekend, then you can get this on Amazon at a price about $37. The thermostat is the dehydrator’s most redeeming feature. You can adjust it to 95°-155°F. But, you’ll have to make sure that you keep an eye out on the food because it doesn’t have a timer. You should set a timer with another device to ensure that your food is thoroughly cooked and not overdried. Most consumers weren’t pleased when using the Rosewill Countertop Portable Electric Food Fruit Dehydrator Machine. One stated that the machine started to fall apart when it was in use. After unboxing it, they noticed one of the parts broken and the second part deteriorating after the second day of using it. The heating element is also another main focus of concern. Customers stated that the device’s heating system doesn’t work. The fan will turn on, but no heat comes out of the device. If this issue happens, try to get a replacement immediately. Another issue was the halogen light bulb that comes with the dehydrator. After about 5 days of using it, the lightbulb would stop working. If you plan on getting this product, make sure that you get replacement light bulbs in the event this occurs. And, you might want to be careful when placing small food inside the dehydrator. The food will fall out of the device, leaving it inedible and unheated. Measure the size of the food and make sure that it’s no smaller than 2 inches for it to be dried correctly. The Rosewill Countertop Food Dehydrator Machine has over 250 Watts of power. While this can be used to dehydrate food, understand that it’s not powerful enough for heavy-duty cooking. This means that you’ll have to wait longer for your food to be fully dehydrated. For heating, its bottom mounted fan is less efficient than other devices. This makes it harder for the top sections of the device to receive heat. Place your food on the lowest tray to ensure that it will be dried correctly. 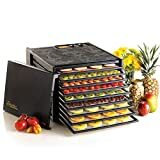 Overall, if you don’t have any other option or need a quick throwaway dehydrator, then this dehydrator will be useful. Bottom heater can be clogged from the food.